Steven Cannon’s death, like his life, was surrounded by chaos. When he was murdered, he was partying with a small group of lifelong family friends, but the evening ended with an alcohol-fueled brawl. It’s been 8 months and his murder remains unsolved. 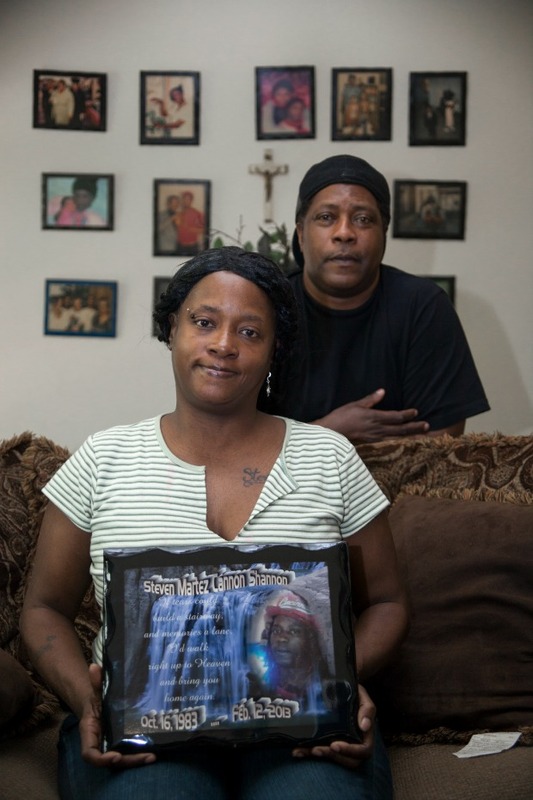 In many ways the murder of Steven Cannon is typical of many killings in Chicago. Cannon was a black man under 35 who lived in a poor neighborhood on the South Side of Chicago and had gang ties and a criminal record. But family and friends say he was more than just a gang member. They describe Cannon as a nice person who got into some trouble but was also a loving son and father. The two met through mutual friends in 2003, when Cannon was 20 and Russell was 14. For Russell, it was Cannon’s rough edges that first attracted her to him. “Yes, yes, yes, I loved it,” Russell says. The two dated on and off from 2004 until Cannon’s death this year. Their relationship was turbulent. Russell has two children with different men, and Cannon was arrested and convicted of domestic violence after a fight he and Russell had in 2010. Despite police involvement she insists it was nothing serious. “We had fights and problems like any couple,” she says. The domestic violence charge was not Cannon’s only arrest. According to court records, Cannon was convicted of armed robbery shortly after he turned 18 in 2001 and sentenced to six years in prison. In the years after his release he was arrested about a dozen more times. “Nobody is a saint, but he was an amazing person who took care of his kids and always looked out for me,” Russell says. Russell says before he died Cannon was settling down. He was working part time for an electric company going door to door trying to get people to change their electricity provider. She says he loved sports and watching the History and Discovery channels. Cannon and Russell were drinking at their place on a Friday night last December with Lavon Stafford when they decided to go a party at Stafford’s cousin’s house. Stafford was a family friend; she and Cannon grew up on the same block. They met when they were each 9 years old. Steven Cannon’s mom, Annette Cannon, says their two families grew up together. The eight or so people at the small family party were people Steven Cannon had known since he was a child. Cannon, Russell and Stafford were already drunk when they got to the party, and they stayed at the house until about 3 a.m.
As they were getting into Stafford’s car to go home, Russell realized she had left her phone inside and went back in to get it. While she was in the house, Russell says one of the men inside cracked a joke, telling her nobody wants your crappy phone anyway. She swore at him and they started arguing. Then she says the man followed her outside yelling at her. As the two approached the car, Cannon got out to confront the man and the two of them got into a fistfight. At least three other people came out of the house and gathered around as the two went at it. The accounts of the next few seconds all vary and contradict each other. Russell thinks Cannon was hit in the back of the head with a bat; Annette Cannon heard it was a two-by-four; according to the police report Cannon was hit with a glass bottle. Stafford thinks something was thrown. Stafford says she too was close to the fight, trying to get Cannon back in the car. But she says she didn’t see who killed him either. Annette Cannon doesn’t believe either of them. There is no way, she says, they could have been standing so close by and not have seen who did it. She’s suspicious of Russell, her granddaughter’s mother. She pulls up a text message Russell sent her 16 hours after Steven Cannon was hit. It says “Miss Cannon I found out what happened.” But now Russell claims ignorance. Even though she isn’t helping with the investigation, Russell says she is furious that Cannon’s killer is still a free man. She says she thinks police are apathetic because of Cannon’s criminal record. Cerven says he is still investigating the murder, but without witnesses coming forward, Cannon’s case won’t be solved. “It’s just a matter of people not coming forward,” Cerven says. Steven Cannon spent two months on life-support at a hospital in west suburban Hinsdale. On Feb. 12, 2013, doctors convinced Annette Cannon to let her son die. In the months since, months of stewing and frantic thinking, Cannon’s grown angrier and angrier with uncooperative witnesses. She’s frustrated with Detective Cerven, with Lavon Stafford and her family, and with her son’s girlfriend Sherree Russell. Their relationship has become increasingly strained as Annette Cannon has become more skeptical of Russell’s version of the night of the murder. In fact the two of them haven’t been talking, which means Cannon has also been losing contact with her granddaughter. Patrick Smith is a WBEZ reporter. He reported and wrote this story as part of the "Forgotten Dead," a Columbia College student project that looked into unsolved murders in Chicago last year. Follow him on twitter @pksmid.